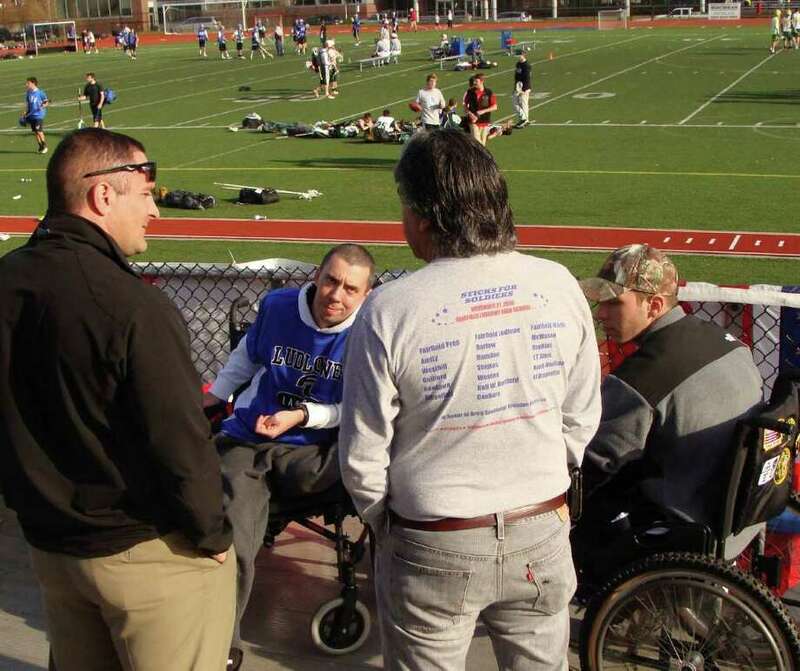 The annual "Sticks for Soldiers," a Thanksgiving weekend charity lacrosse tournament at Fairfield Ludlowe High School, has a primary goal to provide wounded military personnel with financial and emotional support, giving thanks to the men and women who put their lives and limbs on the line every day to preserve American freedoms. A secondary objective of the event is to raise awareness among high school athletes about the unseen sacrifices being made on their behalf by people who often are only a few years older. The presence of a 19-year-old U.S. Army private, who lost his left leg above the knee when an improvised explosive device detonated in Afghanistan's Kandahar Province on July 18, underscored that mission Saturday at the 6th annual Sticks for Soldiers event. Joshua Budd, of Cheshire, was one of three honorees at this year's event, and will be a beneficiary of funds raised through the tournament and related events. Budd and the two others -- Sgt. Liam Dwyer, 30, a U.S. Marine from Southbury, and Tech Sgt. Joseph Wilkinson, 32, U.S. Air Force (retired), of Nassau, N.Y. -- watched lacrosse teams in action on Ludlowe's field between a stream of handshakes and thank-yous they received from the hundreds of players, parents and other supporters. "They're such young guys. The age really hit me. That could be me in a couple of years. That really hit home for me," said Dennis Nelson, 15, a Ludlowe freshman, who has an 18-year-old brother. "It's so courageous, what they did," said Greg Terry, 15, of Fairfield, a freshman at Fairfield Prep. "You hear about the people who serve (in Afghanistan and Iraq), but you don't really know them. But when you meet them you know it happens. It's real. It's real people getting hurt," he said. "And giving their lives," Nelson added. "This is one of the best teachable moments," said Alex Marrocco, the father of Brendan Marrocco, a 24-year-old U.S. Army Specialist from New York, who lost his arms and legs in an explosion in Iraq and was last year's Sticks for Soldiers honoree. Alex Marrocco said the timing of the annual event is poignant. "Not that you shouldn't be thankful for what you have year-round, but on Thanksgiving that's highlighted. You give thanks and honor the service and sacrifices that very few people make for this country." Kendall Stevenson, 17, a senior at Ludlowe and a member of the school's girls lacrosse team, shook the hand of each veteran and thanked them for their service. "They're out there (risking) their lives for us. This is the least we can do," she said. "Thanksgiving is such a family-oriented holiday and it really makes you count your blessings. When I see them without limbs it puts things in perspective. The little worries in life become miniscule," Stevenson said. Like Budd, Dwyer lost his left leg above the knee when an IED exploded in Afghanistan. Wilkinson contracted a mysterious illness, presumably while on active duty in Iraq, which has compromised his spinal cord and led to progressive leg paralysis and strength loss. All three men use wheelchairs. "Don't feel sorry for them. Admire them. Admire their courage," said Sticks for Soldiers guest speaker Lt. Col. Thomas Armas, of Fairfield, commanding officer of the 3rd Battalion, 25th Marines in Brook Park, Ohio. "They don't join (the military) to fight a war. They join to serve a grateful nation,"
Armas spoke at a ceremony mid-way through the event, which featured a record 37 lacrosse teams from throughout the state, including for the first time four girls teams. By comparison, the first Sticks for Soldiers event in 2006 had only six teams involved, according to Jim Tommins, tournament chairman and organizer of this year's event. In his remarks, Armas cited President John F. Kennedy's inaugural speech in which he said, "Ask not what your country can do for you. Ask what you can do for your country." Armas said that Kennedy's challenge more than five decades ago is more relevant today than ever before. "There are too many people asking, `What are you doing for me,' when these young men ask for nothing," he said. Given a choice, Armas said, these veterans of the Iraq and Afghan wars would finish their rehab as quickly as possible and get back to their units to continue serving any way they could. He said if you asked them they would probably tell you they are uncomfortable with all the attention and praise. "They'd rather be serving," Armas said. Dwyer said he wanted to attend Saturday's event because, "You've got a bunch of people out here raising money for wounded warriors. I wanted to be here to tell them how much I appreciate what they're doing for me." "It means a lot. It shows how much everybody supports us and cares," Budd said. Wilkinson said it is "unbelievable just to see people come together and put this whole thing together on their own time to give back to the troops." Tommins anticipates this year's Sticks for Soldiers will raise at least $30,000. Over its six-year history, Sticks for Soldiers has raised a total of more than $100,000. "They gave to you. Now you should give to them," Armas said.